Description: Customize 5 unique soldiers with hundreds of weapons, attachments, armor upgrades and camouflages. 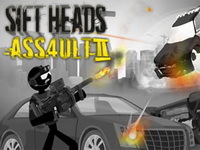 Move and shoot through several missions and don't forget to kill all baddies. Play the campaign for an action packed continuation of the Strike Force Heroes storyline or try your luck at the new slot machine to win rare weapons and hop into a custom game.